"Commissions that are custom for each client public, commerical or residential"
Sally Eckert lives with her family in the beautiful mountains of Boulder Colorado. Sally has her B.F.A from Parson’s School of Design in Environmental Design and has furthered her studies in Europe, learning the Dutch Master egg tempera technique. She works and hosts shows, at her “Art Space Gallery” in the North Boulder art district. In addition, Sally shows her visionary paintings in Denver. 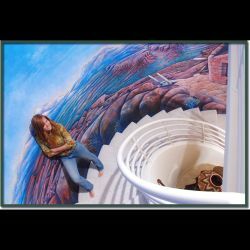 Her mural work has been featured on Channel 9 news as well as in homes and commercial locations. She has won public mural competitions for Boulder Housing Partners, and Thistle Housing . Sally has owned her own business since 1992, painting furniture, murals, visionary paintings and commissioned works. Sally believes that art should have an impact and a story. Sally works to achieve the goal of an incredible piece, valued and enjoyed for a lifetime.